X-ray photoelectron spectroscopy (XPS) is a surface-sensitive quantitative spectroscopic technique that measures the elemental composition at the parts per thousand range, empirical formula, chemical state and electronic state of the elements that exist within a material. XPS spectra are obtained by irradiating a material with a beam of X-rays while simultaneously measuring the kinetic energy and number of electrons that escape from the top 0 to 10 nm of the material being analyzed. XPS requires high vacuum (P ~ 10−8 millibar) or ultra-high vacuum (UHV; P < 10−9 millibar) conditions, although a current area of development is ambient-pressure XPS, in which samples are analyzed at pressures of a few tens of millibar. Contact Dr. Jouko Lahtinen or Dr. Jani Sainio for pricing information. 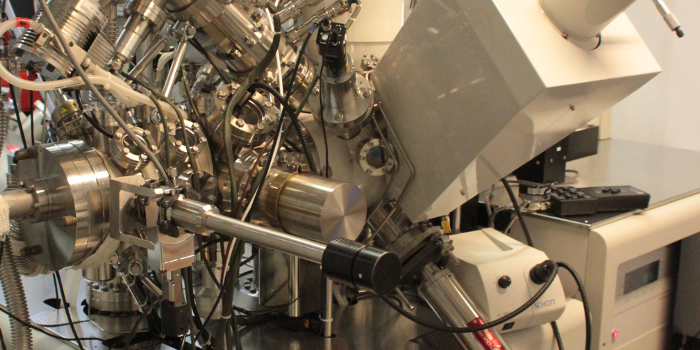 The system is an X-ray Photoemission Spectrometer (XPS, ESCA) enabling elemental concentrations, chemical state identification and chemical state mapping of the surface. The system contains a dual anode (Mg and Al Kα source) and a monochromated Al Kα source. The analysis area varies from 110 μm down to 15 μm, and he ultimate lateral resolution is 5 μm. There is also an He-source enabling Ultraviolet Photoemission Spectroscopy (UPS). Ar Gas Cluster Ion Source (GCIS) capable of generating Ar cluster size up to 2000 atoms. The cluster source enables depth profiling of both hard and soft materials. The ion source also enables Low Energy Ion Scattering Spectrocopy (LEISS). Contact Dr. Jouko Lahtinen or Dr. Jani Sainio for availability information. The system will operated by current operators only. No training available.